OWL recently conducted a Q&A with Jenny Yu, MD, vice chair of clinical operations for the department of ophthalmology, UPMC Eye Center, and co-founder of Project Theia. Dr. Yu, you joined OWL in 2017. What prompted you to join the organization, and what experiences do you look forward to as a member of OWL? 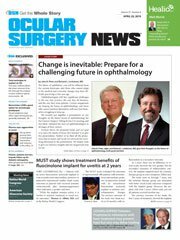 I think that OWL is a unique organization with members from industry, academics and private practice who all strive to make eye care better. I am hoping to share ideas and make connections. I look forward to meeting new people within the ophthalmology space who share common interests. 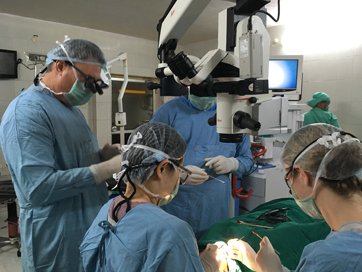 Dr. Rich Hertle looks on as the oculoplastics team from Project Theia performs surgery. You are co-founder of an organization called Project Theia. What does your organization do? I co-founded Project Theia with Dr. Katie Duncan in 2017. We are both oculoplastic surgeons, and we felt that there was a need for a specific nonprofit organization focused on the intersection of facial reconstruction and vision. The mission of Project Theia is to provide care, education and resources in the realm of oculoplastics for children and women who would otherwise not be able to fulfill their full potential due to their appearance and vision loss. Project Theia’s work takes place abroad. Have you taken any trips recently? Our most recent trip was to Goutami Eye Clinic in Rajahmundry, India. It is an established eye clinic with two or three ophthalmologists but no oculoplastics coverage. As oculoplastic surgeons, Katie and I require very little specialized equipment to perform our surgeries, so we can easily work inside existing eye clinics like Goutami not requiring specific resources. We were at the clinic for 5 days and operated on 20 patients. Our procedures in India ranged from ptosis surgery, to socket reconstruction so that a patient could wear a prosthesis, to repairing traumatic scars around the eyelids. We performed these surgeries on both children and adults. The procedures helped patients’ appearance in addition to either restoring sight or relieving ocular discomfort. Katie and I were the only physicians on this trip to India. In addition to seeing patients and performing surgery, we also gave lectures and discussed cases with the local physicians. We assisted the local physicians in surgery as a way to teach them some of the techniques for eyelid and lacrimal surgery.